The 12-month forecast through September 2019 indicates moderate to severe deficits in Turkmenistan, Uzbekistan, and western Kazakhstan, which will be particularly intense around the Garabogazköl Basin in northwestern Turkmenistan. Scattered surpluses are forecast for eastern Kazakhstan. Surpluses are also forecast for eastern Kyrgyzstan and deficits in a band across the country’s narrow girth. Moderate deficits are forecast for the Upper Volga River Basin and Trans Volga region of Russia, surpluses in the Middle and Upper Ob River Basin, and moderate to exceptional deficits in the Yenisei River Basin. The forecast through March indicates intense surpluses in the Ob River Basin in Russia, and along the Vakh, Pur, and Taz Rivers. Surpluses are also forecast in the Yenisei River watershed. Surpluses will shrink somewhat but persist in the Northern European Plain. 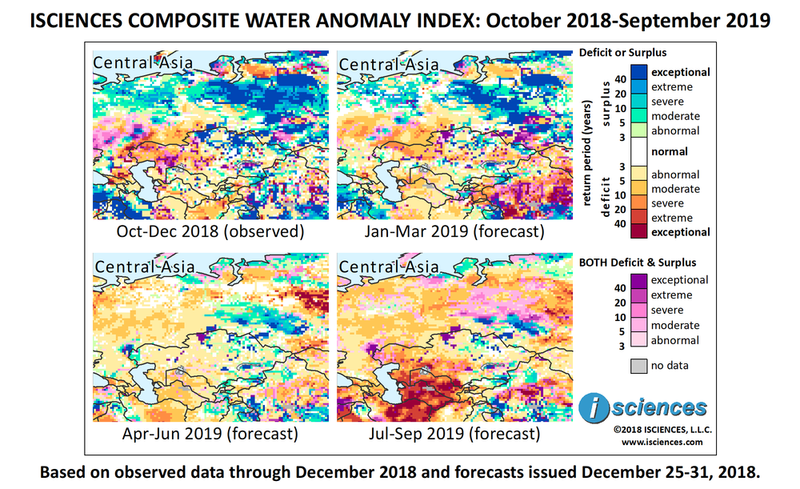 Moderate to severe deficits are forecast for the Ural River Watershed in northwestern Kazakhstan and across the border into Russia, as well as the Upper Volga River Basin and parts of the Trans Volga region. Surpluses are forecast in Kazakhstan along the Ertis (Irtysh), Esil, and Ile Rivers, and south of Lake Balkhash. Moderate deficits are forecast in western Turkmenistan and Uzbekistan and severe deficits around the Garabogazköl Basin in northwestern Turkmenistan. Surpluses are expected on the Zarafshon River in eastern Uzbekistan. Deficits are forecast for central Kyrgyzstan and severe deficits in eastern Tajikistan; surpluses are forecast for eastern Kyrgyzstan and western Tajikistan. From April through June, conditions in much of the Yenisei River Basin will transition from surplus to intense deficit, especially along the Lower and Podkamennaya Tunguska Rivers, eastern tributaries of the Yenisei. Surpluses will nearly disappear in the Lower Ob River Basin and will shrink and downgrade in the Middle and Upper portions but remain widespread. Surpluses are forecast for the Lower Volga region and moderate deficits in the Middle and Upper portions of the Volga Basin. The Northern European Plain will transition from surplus to normal or deficit conditions. Moderate deficits are forecast for much of Turkmenistan and western Uzbekistan, and primarily moderate surpluses for pockets of eastern Kazakhstan and pockets of Kyrgyzstan and Tajikistan. The forecast for the final months – July through September – indicates a significant increase in the extent and intensity of deficits in Turkmenistan, Uzbekistan and western Kazakhstan, with severe to exceptional anomalies. Deficits will increase across Russia as well.